This description of the gossipy habits of barbers might seem to be taken from a recent movie or TV series. Readers will remember how upset Parks and Recreation’s Ron Swanson was when his old barber died: in fact, Ron had had a hard time finding a quiet barber who allowed him not to utter one single word and to remain completely silent during the shaving and the haircut. And yet the quotation was written in the sixteenth century, by Tommaso Garzoni (1549-1589) in his popular encyclopedia of “all the professions of the world.” The chatter-barber is an old: it has traveled – undergoing several transformations – from classical Rome, when writers like Ovid and Plutarch penned it, to the modern world thorugh the Renaissance. In this passage, the intent of Garzoni is clearly satirical, but it contains an element of truth: strikingly similar to their modern-day counterparts, it appears that early modern Italian barber-surgeons were indeed experts in communication. 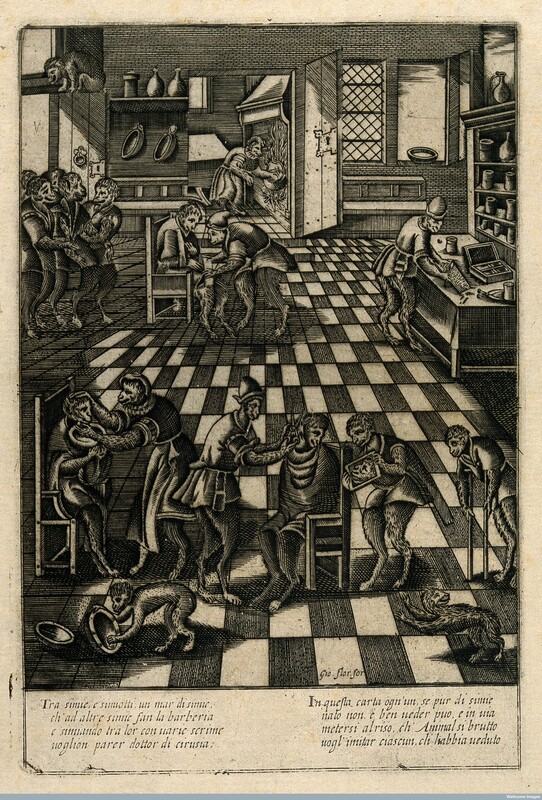 But contrary to modern-day incarnations of the barbershop as a hub of idle chit-chat, the early modern barbershops was a place in which barber-surgeons strategically used information about the world and exercised their manners to deal with their customers and patients in a considerate and respectful way. Singerie of a barbershop. Engraving after P. van der Borcht. © Wellcome Images, Wellcome Library, London. 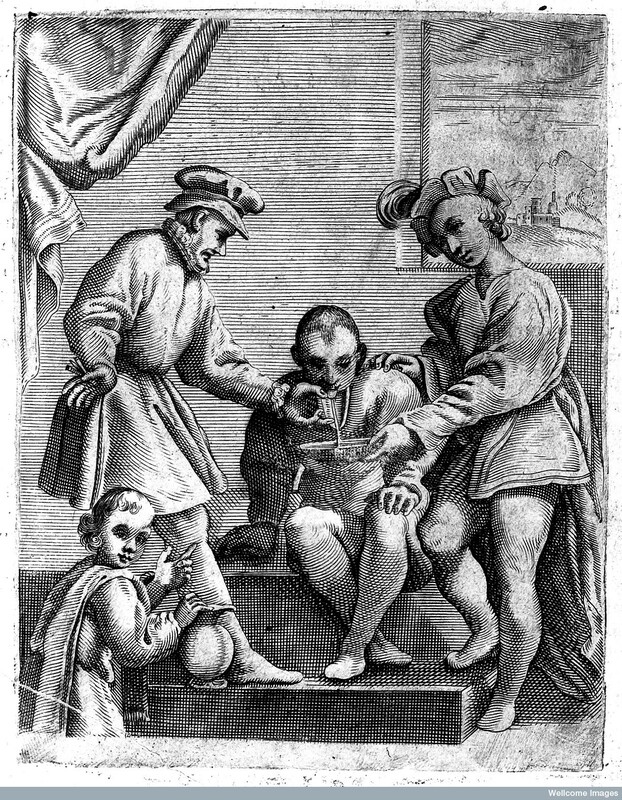 Unlike modern hairdressers, the duties of early modern barber-surgeons included not only care about appearances (shaving beards, cutting hair, and generally cleaning the body of its “excrements”) but also the performance of particular healthcare procedures such as applying cupping glasses, cautery and, above all, bloodletting, one of the most ubiquitous and sought-after treatments in early modern Europe. We have a snapshot of the occupations of Italian barber-surgeons that dates roughly to the middle of the sixteenth century, when the Protomedicati (elite medical magistracies composed of university graduate physician) were institutionalized and the guilds of barber-surgeons renewed in all the states of the peninsula. Barber-surgeons were officially placed under the control and supervision of graduate physicians: they all had to get a license from the medical colleges after passing an examination, they could only treat conditions pertaining to the external surface of the body, and they could only perform bloodletting under the prescription of a physician and under his supervision. Despite some cases in which barber-surgeons were brought to court by the Protomedici for trespassing these boundaries, there is little evidence of harsh conflicts between barber-surgeons and physicians in early modern Italy, both because physicians were tolerant, and because barber-surgeons had enough business for themselves to make them willing to comply with official rules. It is true that in during the early modern period, the emphasis shifted more and more towards the “barber” and less and less the “surgeon” element of the occupation, as the specifications of surgical education relegated them to the realm of aesthetics rather than that of health. But unlike what happened in northern France and England, the coexistence of the two professions seem to have been relatively peaceful, partly because of the strong tradition of teaching surgery in Italian universities helped to clarify the boundaries between them. What is less known about barber-surgeons is the relationship they entertained with their patients and customers, and what kinds of spaces of socialization barbershops were.On closer examination, it appears that barber-surgeons used to deal not only in health and appearance, but also in news: they attracted customers by distributing information. In 1591, Venetian authorities made an inquiry into alleged insults received by a Spanish barber operating in the city: someone had read out a satrirical poem against the Spanish crown in his barbershop. One of the customers testified that the barber-surgeon had requested a copy of the satirical poem and had asked the reader to write it down with his ink on a piece of paper, thus revealing that such equipment was not uncommon in the shop, and that political information and partisanship were common features of the life of a barbershop. In Bologna, one manuscript history of the city written by a certain Alessandro “barber of Bologna” covering the years between 1571 and 1616, includes political news of the city, news about the visits and parties of great and famous noblemen and women, and murders and sensational events concerning lower class people. This suggests that barber-surgeons were often “up-to-date” and had a certain competence in matters regarding international politics. The writing of a history, or chronicle, was usually an intellectual activity reserved for patricians and members of the upper-class of urban society, so it is reasonable to conjecture that such a task was made possible by news the writer was able to obtain in the course of his professional practice. Other scholars have in fact noticed that barber-surgeons served as legal experts in cases of violence much more often than physicians, and that by the seventeenth century they teamed with other professional body caregivers to serve the complex aesthetic needs of the upper classes, both circumstances that brought them in touch with the latest news and gossip. Such people had to pay a fee, and in order to reassure the authorities, Pietro offered them to read the news for themselves before publicly spreading them. We do not know how the project went, or if it was ever carried on, but it is rather safe to speculate that the idea of running such a place came to Pietro Vecchi when he was hearing and redistributing news as a barber-surgeon. 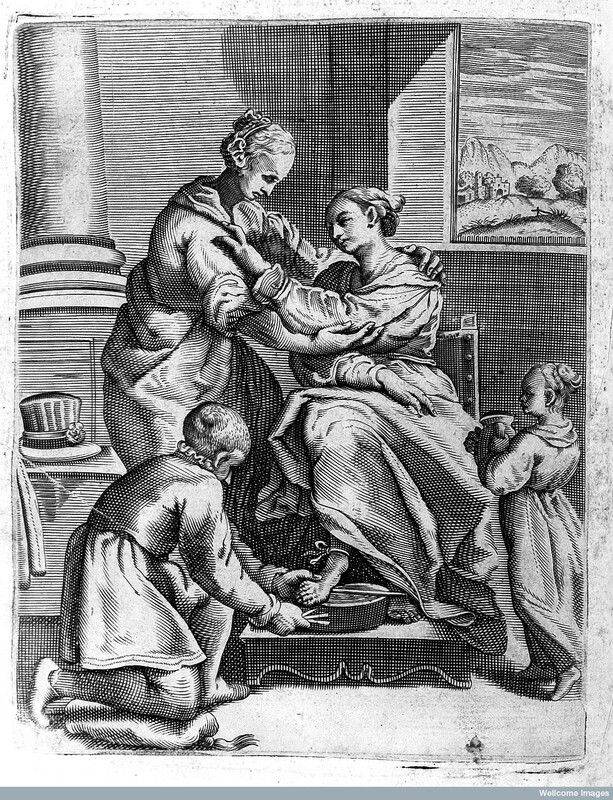 Bloodletting from the foot being performed on a female. Tiberio Malfi, Il barbiere…libri tre. Naples, 1626. ©Wellcome Images, Wellcome Library, London. Bloodletting from the tongue being performed on a male. Tibero Malfi, Il barbiere… libri tre. Naples, 1626. ©Wellcome Images, Wellcome Library, London. One special section of Malfi’s book is devoted to suggestions about what to do if the patient faints during bloodletting. A patient can indeed faint for four reasons: the loss of too many spirits; intense pain; abundance of choleric humors; and fear. Malfi is particularly interested in techniques for managing and easing not only pain, but the fear of expected pain, and the general fear of the surgical operation. He tells his readers that there are certain people who think bloodletting is “a terrible thing,” and suggests this originates “in imagination alone, and therefore one must take care of it only through specific means that divert it from the surgical procedure, like persuade patients that bloodletting is a rather light procedure to suffer through, and that the barber-surgeon is very much experienced and skilled.” Another trick consists in engaging patients in intense conversation on topics which they please them and that they are “taken by”, then make them face in another direction, and suddenly cut their vein. Attracted by the perspective of learning the latest news, whether serious political information or gossip, and lured by the specific social and psychological skills of the owners, it appears that a vast clientele of all classes and both genders spent interesting hours at the barbershop, even in situations of great distress. Both as news dealers and as experts and manipulators of emotions, early modern barber-surgeons became self-styled technicians of human imagination. Paolo Savoia has written on the history of sexuality, historical epistemology, and the history of medicine. He has been a graduate fellow at ‘Villa I Tatti – Harvard Center for Italian Renaissance Studies,’ and a fellow of the ‘Council on Library and Information Resources.’ He is currently writing a dissertation about the social and cultural history of surgery in early modern Europe in Harvard’s department of the History of Science. Tommaso Garzoni, La piazza universale di tutte le professioni del mondo . Turin 1996, vol. 2: 1375-76. See Richard Palmer, “Physicians and Surgeons in Sixteenth-Century Venice.” Medical History 23, 4 (1979): 451–60; David Gentilcore, Medical Charlatanism in Early Modern Italy. Oxford ; New York: Oxford University Press, 2006; Gianna Pomata, Contracting a Cure: Patients, Healers, and the Law in Early Modern Bologna. Baltimore: Johns Hopkins University Press, 1998; Elisa Andretta, “Universo Dei Medici E Mondo Dei Chirurghi Nella Roma Cinquecentesca. I ‘Capitula Concordiae’ Del 1534.” Medicina & Storia 9, 17–18 (2011): 65–97. The case has been analyzed by Filippo De Vivo, Information and Communication in Venice: Rethinking Early Modern Politics. Oxford: Oxford University Press, 2007: 143-46. Biblioteca Universitaria di Bologna, ms. 1124. Alessandro Pastore, Il medico in tribunale: la perizia medica nella procedura penale d’antico regime (secoli XVI-XVIII). Bellinzona: Casagrande, 1998; Sandra Cavallo, Artisans of the Body in Early Modern Italy: Identities, families, and Masculinities. Manchester: Manchester University Press, 2007. Pierangelo Bellettini, “Pietro Vecchi e il suo progetto di lettura pubblica, con ascolto a pagamento, delle notizie periodiche di attualità (Bologna 1596).” In Pierangelo Bellettini, Rosaria Campioni, and Rita Zanardi, ed. Una città in piazza: Comunicazione e vita quotidiana a Bologna tra Cinque e Seicento. Bologna: Compositori, 2000: 68-76. Tiberio Malfi, Nuova prattica della decoratoria manuale e della sagnia; l’una a barbieri, et l’altra a chirurgici singolarmente necessaria. Naples, 1629: 33-34. The social role of music in the barber’s shop is worthy of note. Wills and inventories in various countries frequently mention musical instruments such as lutes. Thank you, David, this is absolutely right. Music was played in barbershops in early modern Southern Italy too, as historian and anthropologist Giuseppe Pitré has showed in his “Medici, chirurgi, barbieri e speziali antichi in Sicilia, secoli XIII-XVIII” (1939).